In the heart of a field of 6 ha wood and orchards, this furnished any comfort is in a farmhouse of Provence renovated. You will appreciate air-conditioning, calms absolute, the unspoiled view on Luberon and the mounts of Vaucluse, the water swimming pool salted with great beaches around, the pool house with its barbecue... and the cicadas in background music, the summer! Many activities in the vicinity.. The bathroom contains a sink, a wall cupboard, a rack, a large mirror, a hair drier, a soap-dish, a glass for the toothbrushes, a radiator dries towel and a large Italian shower. The windows are equipped with mosquito nets and shutters or occulting curtains. The house is equipped with a connection Wifi (ADSL) to have Internet by using your laptop equipped with a Wifi chart. Plays for children are placed at your disposal as well as DVD and books. The material baby is lent on request (bed, chair, bath-tub, deckchair, changing table?). There are also a complete documentation on the activities and visits to be made in the area. Outside, in addition to the swimming pool, there are a bowling pitch, a vat with sand, a target for darts and a large black board with chalks; and of course, the possibility of making many ballades around the lodging. Le gite est super, parfaitement aménagé que ce soit à l'intérieur et à l'extérieur. La patronne est dispo sans soucis. The lodging is on the heights of l'Isle-sur-la-Sorgue, at 4 km of the centre town and 3 km of the supermarkets. 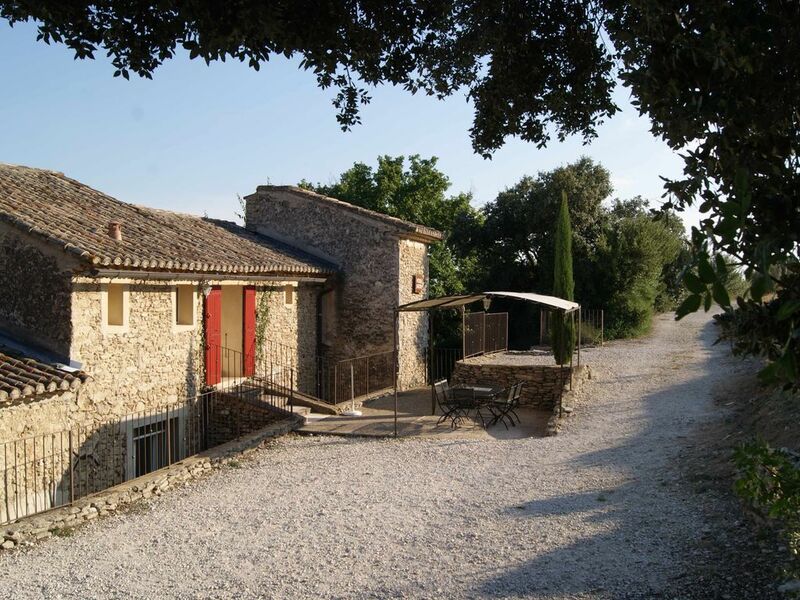 It is in full country, at 200 m of altitude with a very nice view on the Mounts of Vaucluse and Luberon. Its geographical location makes it a privileged place because it is not far away from the principal trade and tourist places of Vaucluse but insulated enough to find itself in a typical nature of Provence (pines, oaks, olive-trees) in a total calm! No vicinity, not of main road. Les réservations se font au minimum 1 semaine à l'avance. Un acompte de 25% est demandé pour confirmer la réservation. Les paiements se font par chèque, par chèques vacances, par virement bancaire ou par espèces.